Probably the best aspect of the internet is that you find information you never would have known if you were still limited to visiting a library. And when you’re done reading here you’ll be very thankful that technology introduced you to some of the best pool bikes and treadmills. But let’s start with what this equipment is. It’s not that well known which means you may be missing out on some dynamic exercising. If you’re in search of better, interesting and safe exercising, keep reading. What is an Aqua Bike? 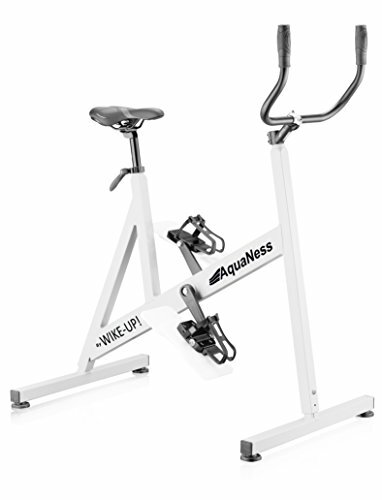 When you use an aqua bike it will be very much like getting onto an exercise bike you see at the gym. The difference is your bike is standing in the water. This notion started in the late 1800s and over the years it developed. Today you can pick from a range of well-designed bikes that can help you target those muscles you simply can’t seem to exercise well during your usual training sessions. The bike doesn’t have wheels at the bottom but legs you position on the bottom of the pool. It has pedals that resemble an average exercise bikes and these make a propeller turn. The water resistance against this propeller is what gives you a tough workout. This can give you 12 times the resistance you’ll get with ordinary cycling. 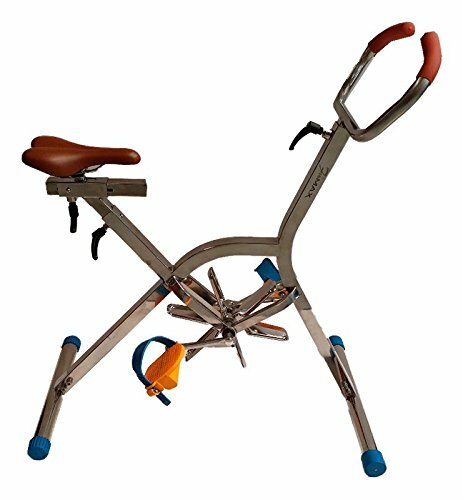 You have a seat to sit on and handles to hold onto as with any normal bike. This isn’t just a fashionable trend. 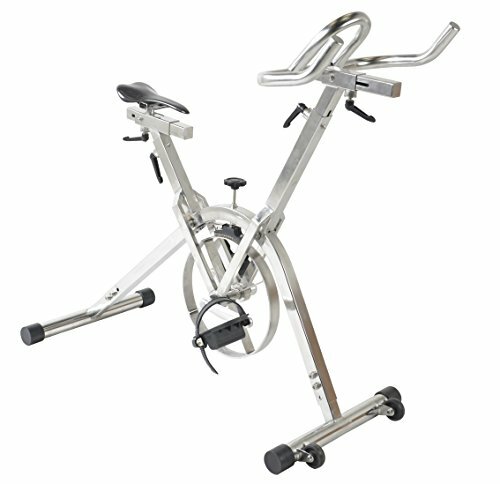 This bike is designed to give you a tough workout but it enables you to exercise with minimal risk. In the water and with the way the bikes are designed there is far less pressure on your joints compared to jogging or even a normal exercise bike. That feature makes this an ideal option for people recovering from injuries who need an exercise method to strengthen their bodies again. When you place yours in a pool you should find a spot where the entire bike is submerged, and the water should come to your torso when you sit. You can use it in almost any pool that provides these conditions and depth. That makes it possible to have dynamic workouts at your home pool instead of going to the gym. Just make sure your bike can handle the pool conditions such as acidity levels. Another application of this approach to exercising is Aqua treadmills. By running under water you use buoyancy to protect your joints from the shock usually present with running. You still get a great workout because of the added water resistance. You’ll have fewer injuries brought on by rigorous exercising because there’s less weight on your joints. Your gym can be at your home. Exercising in a cold-water pool helps you keep refreshed and cool throughout. It gives you a challenging workout since water adds a lot of resistance. It’s a new way of enjoying the outdoors if your pool is in your garden in the open air. You can exercise while looking after kids playing in the pool. Your muscles get workouts and it also improves cardiovascular health. Since these are such novel items you may wonder if they’re worth the investment. Having a safe training option which is comfortable is a worthwhile expense in our books. Thankfully this market did evolve over the years and now you can pick from many options. These notes will help you decide which is ideal for you. As with any exercise bike your seat is a priority item. It must be comfortable, but you also need adjustment options that ensure you sit in a comfortable position. The right position also optimizes muscle workout. Some bikes aren’t practical for very short or tall people so review each bike’s specs before you buy. Your bike will be in water much of the time and this carries the risk of deteriorating the structure. Ideally your bike should be made of marine grade steel that won’t be affected by pool salt, minerals or even the temperature. Just because you’ll be in the pool you can’t expect a leisurely workout. Make sure the bike can handle rigorous training sessions, your weight and hard pedalling. An excellent way to gauge a bike’s value is to look at the warranty. Make sure you’ll be covered if something happens during the first few months. This is an item that can easily wear and tear since you’ll most likely be moving it around a lot. If you get good quality components it will serve you well for many years. Which one of these is best for you? It’s reasonably customizable as you can adjust the seat and the handlebars. What we like most about the design is that the legs have scratch resistant fittings, so they won’t damage your pool. Some smart design went into the wheel component as it’s jam resistant. 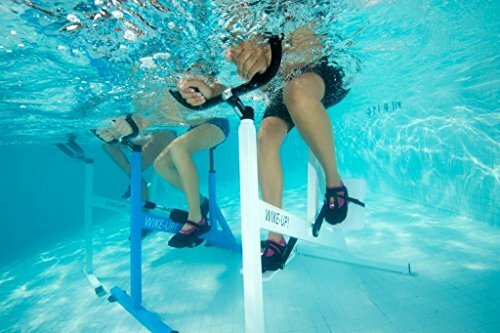 With this design you don’t contend with only the water: There’s a resistance knob too to enhance your workout options. Incorporating exceptional technology this bike allows you to keep on pedalling while you adjust the intensity. You don’t lose momentum or put joints under more pressure than necessary by having to build up speed again. It’s scratch resistant to protect your pool and easily portable thanks to the wheels on the legs. It’s also much lighter than other models. 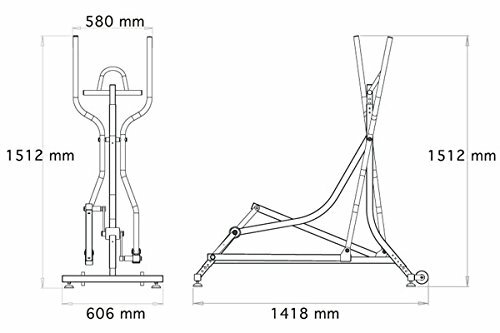 There are various height settings for both handlebars and the seat. Users love the high quality as they can leave the marine grade steel in the pool for days if necessary. If you’re going to exercise every day, why take it out? Check latest price. Because this is a very natural movement almost anyone can do this. The sturdy handles help you keep balance and pace to optimize the workout. The unique movements also exercise both your lower and upper body. It’s made of quality steel and the design comes from a medical team so it’s sure to be safe for everyone, no matter your physical fitness or abilities. They ensured this is an ergonomic way to get an intense workout. Unfortunately, this unique device comes with a high price tag. It’s also heavier than many others so you’ll probably leave this in the pool rather than take it out every day. If you’re looking for portability, you’ll happily pay a little extra for this model. It has most of the features you’ll find on other aqua bikes, but it only weighs 18lb. That makes it a practical option for families. Don’t risk injury by leaving it in the pool where someone can bump into it; rather take it out since it’s so light and portable. It’s a simple design that will work for the whole family no matter their fitness levels by simply changing the blade position. Unfortunately, this takes some effort and you may have to take the bike out of the pool first. This model is not as large as some others so tall people may find it less comfortable. While the metal is of good quality the plastic components may deteriorate fast if left in the water indefinitely. Check current price. 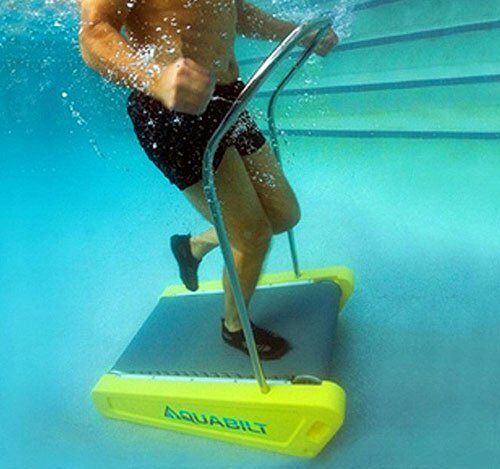 Here’s another original approach to under water exercising: A treadmill. This is already better than doing the same on a regular treadmill because buoyancy helps minimize the pressure placed on your joints. You also exercise more muscles doing it under water than running in the gym. This design comes with a removable handrail which along with the rubber wheels make it very portable. Depending on your build though, you may need help getting it out of the pool. This is more expensive than some aqua bikes though. Some users also complain it doesn’t feel as secure on the bottom of the pool as other devices mentioned on this list. As you continue to use it this problem often dissipates though for most users. Check current price. Have you identified your next piece of gym equipment yet? 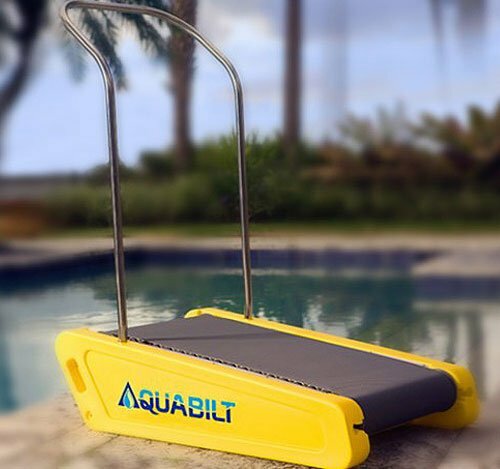 One of these can transform your home pool into a dynamic exercise venue and it could be the first type of exercise you really enjoy doing. 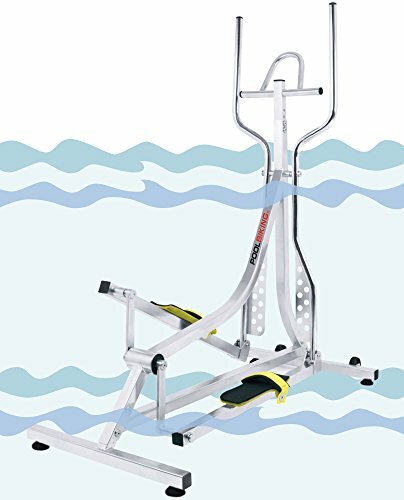 Give this unique method of exercise a try and get aqua bike or treadmill today!